Here are links to conservation incentive programs active in Washington State. This isn’t an exhaustive inventory—our focus has been on voluntary programs offered by federal or state government and available to private landowners. We do include some information on tribal, regional, local, and private resources and incentive programs. Programs are listed under the primary sponsor or administrative entity. This is only one way of organizing the information, and we hope it provides some clarity about where to go for more information. However, listing the programs this way has the disadvantage of obscuring many important partnerships. Links to a multitude of state programs for conservation funding. Tribal culture is built on natural resources so protecting those resources is of utmost importance. Many tribal nations are actively engaged in salmon habitat recovery, both inside and outside reservation lands. 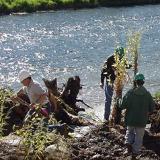 Local conservation incentive programs may be administered by county or city governments or by watershed groups. Mechanisms include tax relief, easement or property purchase, grants, and technical assistance. Private organizations, or public-private partnerships, offer a range of conservation incentives including certification, grants, recognition, technical assistance, and land or easement purchases.